Lentigos are flat brown marks. The most common type, the solar lentigo, is most commonly seen in middle age resulting from sun damage (age spots or liver spots). 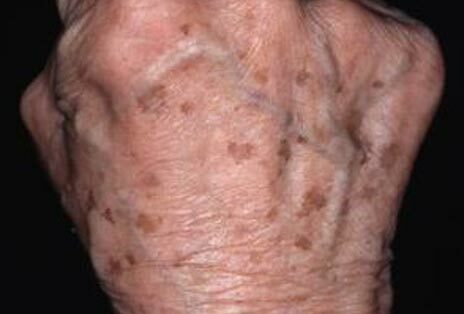 These are most often found on the face and hands and are larger and more defined than freckles. Solar lentigos are common in those with fair skin but are also frequently seen in those who tan easily or have naturally dark skin. Although they are mostly considered to be of cosmetic concern and we do offer a variety of treatments to remove them, they are front and foremost a red flag that there has been significant sun exposure! The dermatologists at Atlantic Dermatology and Laser are extremely experienced when it comes to evaluating any pigmented lesion and we know not to disregard seemingly benign solar lentigos.We are always on alert for a variant of malignant melanoma called lentigo maligna which can mimic the simple solar lentigo. The freckle may have arisen recently, can be seen to have more than one colour or presents with irregular borders. Such lesions should be completely removed by surgical excision, with pathological examination. A big concern of ours with the proliferation of laser treatment centres and medispas run by therapists is the incorrect treatment of these dangerous malignancies as simple solar lentigos. The risk of incorrect treatment is that scar tissue caused by these treatments can actually mask the atypical cells dividing below the surface of the skin and these patients then present much later with much more advanced spread. We urge our patients to carefully check with us before undergoing any such treatments.